One of the first things you’ll notice when visiting Door County, Wisconsin is that the pace of life slows to a manageable level. While strolling any of the 14 communities, it’s a common sight to see couples arm-in-arm or holding hands. Door County is often referred to as “the Cape Cod of the Midwest.” Though less than 30,000 people call Door County home, the number of visitors can swell to more than 200,000 on any given weekend from Memorial Day through Labor Day. 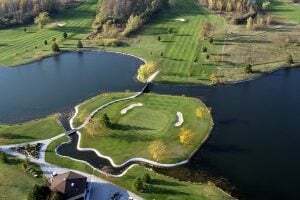 Idlewild Golf Course is one of 11 courses in Door County. Jon Jarosh, Door County’s director of communications and PR for the county, shared the following statistics: “There are 300 miles of Lake Michigan shoreline, 53 public beaches, 19 county parks, five state parks, eight wineries, 2,500 acres of cherry orchards, 11 lighthouses, and 11 golf courses.” Impressive as these are, the statistic that really opened my eyes was this: Door County features more than 58,000 yards of fairways! That’s a boatload of potential golf waiting to happen! Located about an hour’s drive north of Green Bay, Door County is the Badger State’s geographical “thumb” and is surrounded on three sides by Lake Michigan. With more than a dozen RV parks available, Door County has something for everybody. A centrally-located resort for exploring the many wonders of Door County is Egg Harbor Campground and RV Resort. Featuring 20, 30, and 50 amp power, the resort offers 130 full hookup sites, 40 of which are pull-throughs to easily handle the largest motorhomes and campers. Nearby activities include cave kayak tours, paddleboard rentals, zip-line tours, go-carts, and mini-golf to name a few. One thing you can’t miss in Door County is the fact that cherries are a big deal, and have been for a number of years. Once known by the Cherryland USA moniker for its lead role in tart cherry production, Door County is not at the top of the cherry production list anymore, but still ranks in the top five. A number of orchards and specialty shops feature cherries in a creative array of offerings. At Lautenbach’s Orchard Winery and Market in Fish Creek, you can find cherry wine, dark chocolate cherry granola, cherry salsa, dried cherries, cherry tea, and so on. 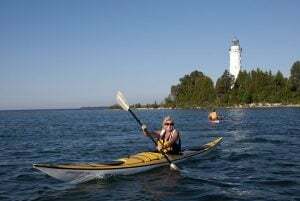 Many visitors are drawn to Door County to explore the 11 lighthouses that dot the county. Lighthouses stretch from Wisconsin’s first lighthouse Pottawatomie on Rock Island at the tip of the county to North Pierhead Lighthouse just south of Sturgeon Bay. Set in Baileys Harbor, Cana Island is one of the most iconic and photographed lighthouses in the country. Today, it also serves as one of three museums in the county. Built in 1868 and automated in 1944, Cana Island Lighthouse is accessible via a 300-foot long causeway that links it with the mainland. Over the last few years, water from Lake Michigan has breached the causeway, but officials now use a tractor and trailer to carry visitors across the causeway. For a spectacular panoramic view, ascend the 97 steps of the spiral staircase to the top of the 89-foot tall tower. There are also two additional maritime museums in Door County: Sturgeon Bay and Gill Rock. With a rich maritime heritage, the museums summarize many details about the area, including the numerous shipwrecks that have occurred in local waters since the last 18th century. A great way to get an overview of the county is through a guided tour. Door County Trolley offers a variety of themed tours throughout the year, including narrated scenic tours, wine tours, lighthouse tours, ghost tours, haunted pub crawls, a Wisconsin supper club tour, Winter Wonderland tour, and spring blossom tour. 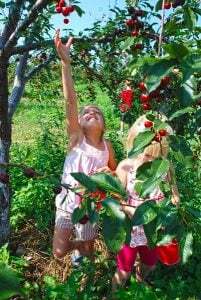 Picking cherries during the summer is a fun family activity in Door County. Don’t miss a visit to the Skyway Drive-In Theatre in Bailey’s Harbor. A few years ago, TripAdvisor named it the top drive-in theater in the country! Skyway still shows first-run movies and hasn’t changed much since opening in July 1950. Fish boils, offered at many Door County restaurants, are popular with tourists, as well as the historical recap and live demonstration before the scrumptious meal. Al Johnson’s Swedish Restaurant with goats on the roof in Sister Bay is interesting in so many ways. And finally, Door County is known for its artistic and cultural communities and boasts more than 100 art galleries, museums, and performing arts venues throughout the county. For more details about Door County, visit DoorCounty.com. You can also read more about Egg Harbor Campground And RV Resort on campgroundreviews.com.